Update – dialogue with Archivo 15M members and movement activists in Madrid via Skype at Bluestockings, NYC, February 23rd at 4pm. Facilitated by Juan Escourido and Occupy Wall Street archivist Amy Roberts. In September of last year, the Casablanca CSOA here in Madrid was evicted. Inside at the time were the 15M Archive and the 10,000+ books of the BiblioSol, the expanded camp library of the movement. A re-occupation over the December holidays failed. (The hours-long CSO was called “Magerit,” after an ancient name for the city of Madrid.) Solidarity demos were held in New York and Copenhagen, and hopefully they made some bureaucrats nervous. Still, the old Casablanca was bricked up to the top windows. Casablanca was evicted, many believe, because they hosted organizing meetings for the 25-S (25th of September) action group which organized the “Occupy Congress” demonstrations. (The giant CSA Tabacalera, which is legalized, was also closed throughout the period leading up to this demo.) The right-wing government reacted to that multi-day demonstration with a shocking display of force, and they have since called it an attempted coup, and tried to criminalize such actions. This isn't only paranoia; an early October poll showed 75% of Spaniards are substantially in agreement with the demonstators! Today the material history of the 15M movement and its literary nerve center remain locked up. 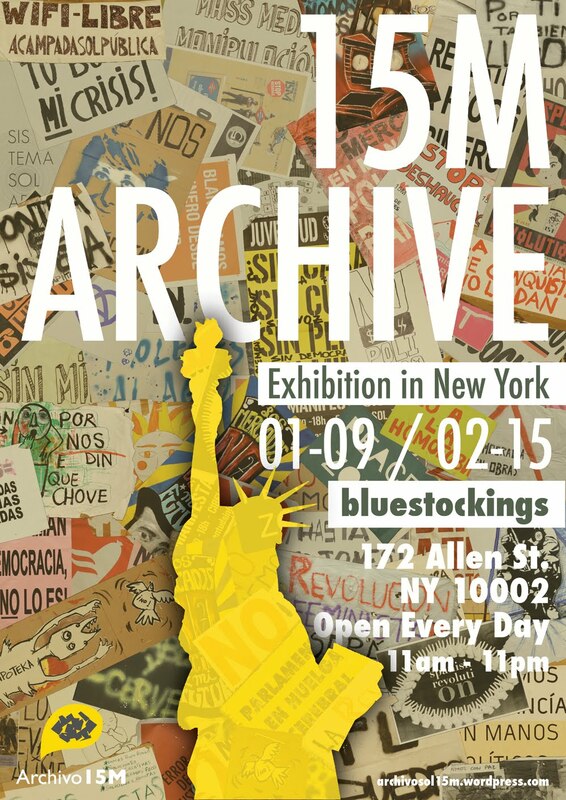 An exhibition of selected digital prints from the archive is currently installed at Bluestockings radical bookstore and activist center in NYC's Lower East Side through mid-February, an international solidarity event coordinated by the “House Magic” project. 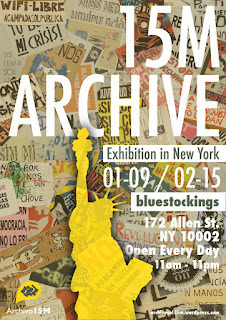 Archivo 15M is also moving to raise the money to get their stuff out of the bricked-up former social center. There are three new social centers in Madrid, so there are a few options for the 15M archive and library to reestablish operations when they succeed in springing their stuff loose.. ESLA Eko is a recent initiative of the Popular Assembly of Carabanchel. The place looks good in pictures, although it is outside the center of Madrid. The other two are not exactly new, only new locations. The group that ran Salamanquesa reoccupied in Chamberí. The place, CSOA La Morada, is big and clean, and looks great. (Rooms are named after other social centers, most of them evicted.) But the assembly of the evicted Casablanca refused to leave the center city. They took a new building in the vibrant immigrant district of Lavapiés, kraaking CSOA Raíces. It opened this Saturday, in a building owned by the nationalized Bankia. It is surreal in there. Stores are open on the ground floor, while the entire inside of the building has been stripped to the bare brick and timbers as part of a massive, indefinitely halted renovation. As the assembly of Lavapiés, some 30 strong, met in the large second floor room, the Archivo 15M group mounted more digital prints from their sequestered archive on the bare brick walls. It's a fine grand space, but cold in this unusually rainy January. (There's no windows in the holes.) Someday this will likely be a luxury loft. For now it's being used by the movement. Back in October, the Archivo 15M group met with a bunch of art students who were passing through town for the “Perder la forma humana” exhibition of Latin American political art and activist culture at the Reina Sofia museum here. That show opened with an extraordinary gathering of activist artists flying over from America to join in discussions. At a noisy cerveceria cafe, the Archivo group spoke of their collection and their problems to a very interested group. The newly fledged post-graduate program of the École européenne supérieure de l’image (EESI) is working a project on the “document and contemporary art.” It's consistent with the recent emphasis in art schools on research-based project practice. The students' questions to the Archivo 15M group were nearly all political. The “meta” did not seem to much concern them. A critique of some of these early efforts at archiving the new social movements appeared on the blog of the U.S. Library of Congress. The writer spotlighted the work of the Activist Archivists, which have spread information to help would-be self-archivers, and created a working group to save material history. That's what Archivo 15M is about. They are 100% self-organized and extra-institutional, unlike the AA's who are hooked up with NYU. The US-LC article gets wonky about the new challenges of archiving digital data, harvesting tweets and all that jazz. All in all, this is a wonderful development, and I think it is something new. Most scholars travel the easy road, the one marked out for them by earlier sojourners, that leads through plentiful groves of archival materials. Movement activists and their sympathizers are starting to plant those orchards now. 15M and Occupy have generated no shortage of texts and histories, photos and comics as well. The international squatting movement also is starting to accumulate a significant scholarly literature. But what kind of research and interpretation is it? This question concerns what is either a lovefest or a kind of quiet struggle between the highly educated and aware cadres of the new social movements and the soldiers of academe – curators, librarians and critics – for control over the materials and the levers of interpretation. Visual culture maven Nick Mirzoeff blogged Occupy for all of 2012. He has recently cranked against the academicism of much Occupy commentary, observing that activists in the movement don't recognize themselves in a lot of this writing. (It's the same syndrome Thomas Frank railed against in his recent “Occupy is dead” text.) Mirzoeff is organizing what he calls “a militant research 'collective visioning'” conference in February at – naturally – NYU. critique and comparative methodology at "The Signal: Digital Preservation"
a self-starter: "Archiving the Occupy Movements from 2011"